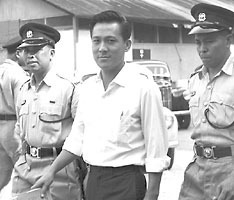 On this date in 1967, Sunny Ang hanged in Singapore for murder. The missing corpse did not present anything like the difficulty the barristers might have anticipated for this landmark conviction. For one thing, everyone knew where and how 22-year-old waitress Jenny Cheok Cheng had died: on a diving trip near the Sisters’ Islands, Cheng had slipped under the waves while her betrothed waited in the boat … and she had never resurfaced. Frogmen combing the area could find only a single swimming flipper: it had been sliced with a knife to make it slip off during the swim, the inference being that the bladehandler had been interested in the inexperienced diver “accidentally” losing her maneuver while the forceful straits currents went to work on her. Loverboy Sunny Ang, a vain wastrel facing bankruptcy,** just so happened to be in line to benefit, having insured his bride-to-be to the tune of nearly $1 million over several policies — including one which he had extended mere hours before the murder, and extended by only five more days. One imagines here that the tampered flipper might have been just one of several innocuous-looking accidents, each one a little lure for the Angel of Death, slated to cross Jenny Cheng’s path during the couple’s seaside canoodle courtesy of her own personal Final Destination. In his young life, Ang had washed out of teacher school, pilot school, and law school. Ang’s laziness went on full display in the murder caper because the hired boatman who took the couple out diving — a witness whom Ang was probably expecting to provide his alibi — took the stand to describe the amazing extent of his guest’s unconcern about his lover going missing. In a situation where the reasonable homicidal villain would anticipate means, motive, and opportunity all implicating him like blazing klaxons, Ang couldn’t be arsed to allay suspicion with the duest of panic-stricken diligence, like putting on his own suit and jumping in the water to look for her, or even raising his voice a few decibels to feign alarm. He did not, however, neglect to file his insurance claims very promptly. Small wonder with bloodless banter like this that his jury only needed two hours to convict him, body or no body. Justice Buttrose: Did you realise that this girl, whom you love and whom you were going to marry, had gone down and disappeared, and you calmly turn round to the boatman and said, ‘All right. Go to St John’s’? Ang: If she was anywhere around the boat we would have seen her air bubbles. Justice Buttrose: It didn’t occur to you to go down and search for her? Ang: Because I thought there was obviously a leak and also if she was anywhere around the boat, we would have seen her air bubbles. Mr Seow: You had skin-diving equipment with you in the boat? Mr Seow: The girl you were going to marry was obviously in difficulty, if not actually dead already. Why didn’t you use your skin-diving equipment to go down? Ang: I was not quite sure what sort of difficulties she was in. It occurred to me — it was a vague thought — that she might have been attacked by sharks. In fact, I remarked upon that to Yusuf [the boatman]. Not then, but long after the incident. Justice Buttrose: You could have gone down to find out? Ang: She might have been attacked by sharks. Mr Seow: When did you change back into your street clothes? Ang: I think I remember I put them on, on my way to St John’s Island. Mr Seow: So that when the Malay divers were going in, you were then in your street clothes, and you saw no point in joining them? Ang: I do not say I saw no point. I was in my street clothes and there were more experienced skin-divers, and there were five of them. Besides I knew the chances of finding her were very slim. Justice Buttrose: You never got into the water at all that day? You never got your feet wet? * Ang went on trial in April 1965, when Singapore was still part of Malaysia — hence the reference to the scope of the country as a whole. By the time Ang hanged, Singapore had been expelled from Malaysia and become an independent polity. ** He had also previously stolen from his father and police already knew that, so he didn’t enter his capital trial with much existing credence for rectitude.